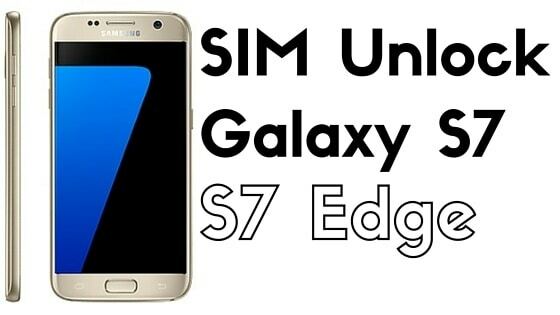 This guide will help you how to successfully SIM unlock Samsung Galaxy S7 and S7 Edge and use it with your favorite GSM carrier worldwide. If you’ve bought Galaxy S7 or S7 Edge device from a carrier such as T-Mobile, AT&T, Rogers, Fido, Telus, Koodo, Bell, Virgin and so on, then it means that it is locked to that particular network until your contract expires with them. If you want to use it with any other carrier/ network, then you will be forced to unlock the Galaxy S7 SIM for it to work.Usually, an SIM for S7 Edge is locked because major carriers don’t want consumers to use the purchased devices with other carriers or networks. Now supposed you’ve bought your phone from AT&T but when you want to use it with another carrier it will ask for “SIM network unlock PIN’. Now you’ve would have come across individual web pages that are showing or offering Free unlock methods, to be honest, those tricks are not working. However, we do provide permanent IMEI unlock solution that will unlock your phone so that you can use it worldwide with any GSM network. No Carrier hassle, You can then easily switch SIM between GSM Networks to get the best rates. Allows you to use local SIM cards on GSM carriers wherever you travel to avoid any Roaming fees. Free your Galaxy S7, because freedom is good. Increase your phone value, if in case you were planning to sell your phone. Why Use Our Unlock Services? Our Unlocking process is really faster, Usually it takes between 1-5 hours. Simply get the unlock code via Email and No Rooting/Software/Cables required. Easily Unlock your phone in Home. No risk of bricking your phone. 100% working and money back guarantee. *Terms and conditions applies. WE BELIEVE IN QUALITY and WE ARE CONCERN ABOUT OUR CUSTOMERS. Please double check your IMEI number, make sure it is 100% correct. We will not refund for wrong IMEI or already Unlocked phones. Once you get the unlock code from us for your phone, follow the step-by-step instructions below to unlock your phone. Step 1: Insert the non-accepted SIM card to your phone and turn it on. Step 2: Phone will display you the SIM network unlock PIN. Step 3: Now enter the 8 digits unlock code and tap the Unlock button. Step 4: You should now see the Network Unlock Successful message. Step 5: Cheers!! Your Samsung Galaxy S7/ S7 Edge is now successfully sim unlocked.